I rarely post anything political, but these next two years are too important to let go by without trying to make clear what is at stake. Below are 244 good reasons to support the President and the Democrats in 2012. No doubt more will be added. – Joint aid and relief planning with the U.K.
…And HE IS A FAMILY MAN ! “I created the Jinn and humankind only that they may worship Me!” meaning “that they may know Me” as the Prophet’s (SAW) cousin Ibn Abbas explained it. – Edited and adapted from a post on Br. Fahad’s Freelance blog. El Maestro de los Jinn – The Spanish Translation! Alhamdulillah! I am happy to announce that Master of the Jinn has been translated into Spanish and is now an Ebook entitled El Maestro de los Jinn. It can be read on Amazon’s Kindle book reader, any PC or Mac, and also the iPad, iPhone, iPod Touch, Blackberry, and Android devices. If any of you can read Spanish, here is a link to the Amazon Kindle pages in the US and the UK, which covers Europe. Please let me know how it looks if you buy a copy :) The paperback version will be out either by Eid al-Adha (November 17th in the US) or the Christmas Holidays, inshallah. your light waiting in the dark. what it tries to hold. 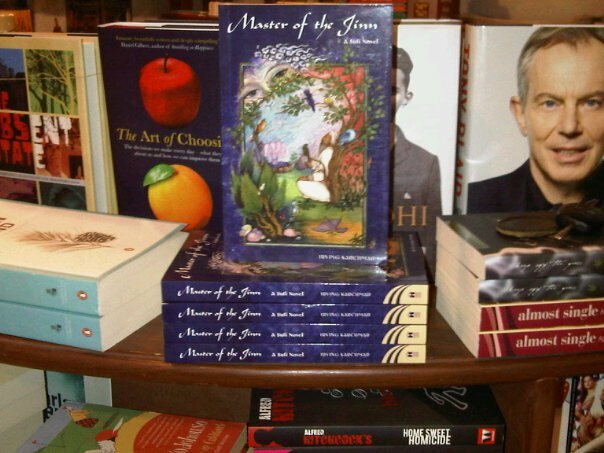 If you are in India and see Master of the Jinn for sale, please take a photo and send it to me at: Irvingk1945 at gmail dot com. PS: You can also order the book in India directly from Hay House, the publisher, by clicking HERE. It is related that many years ago, while Dr. Javad Nurbakhsh, Master of the Nimatullahi Sufi Order, was staying in the New York khaniqah, he came out of his room one morning and walked over to where Mr. Niktab, his closest disciple and the Shaykh of Shaykhs of the Order, was conversing with two young dervishes. They packed a few things quickly and hurried to the airport, took the next available flight, and arrived in Los Angeles just after 4pm. When the Master says go, you go. When they arrived at their destination, it was just past 5:00 pm, and the cousin was yet home from work. The young darvish who suggested it confessed that he could not reach his cousin, so the visit was going to be a surprise. Mr. Niktab didn’t seem concerned, and led them to the small, fenced backyard where they found lawn chairs to sit on. Mr. Niktab meditated for a while, and then began singing one of Master’s poems in Persian, and the other two joined in, clapping out the rhythm. Mr. Niktab smiled at the old man. He did not speak English, but told the young darvish to translate, and tell him they were waiting for his cousin to arrive, and apologized for disturbing him. The old man just nodded and went back inside. When the cousin finally arrived, he was delighted to find his unexpected visitors, and that Mr. Niktab himself had come. He begged them to make themselves comfortable while he made tea. One of the young darvishes was a good cook, and made a delicious dinner for them all, after which they sang and recited Master’s poetry, having an impromptu zekr. Mr. Niktab told the cousin to invite the gentleman next door, and the old man gladly agreed, having been listening to the music through the open windows. He sat next to Mr. Niktab, who through an interpreter chatted with him amiably, and explained about the Sufi path and its dedication to love and service. The old man listened politely, drank the tea, ate one of the offered sweets, and went home sometime later. The next afternoon, one of the dervishes asked Mr. Niktab what they were supposed to be doing. The next night, many more Iranians appeared, the cousin telling his friends that a Sufi Shaykh was visiting his home. And this time Mr. Niktab politely invited the old man for dinner. The food and music and poetry, even in a language he did not understand, seemed to please the old man and put him at ease. Mr. Niktab also told him that the next might, Sunday, was their majlis, their twice weekly spiritual gathering, and that although he was welcome to attend, he would have to listen from the next room, as only darvishes, those already initiated, were admitted into the circle of the Friend. “Then will you initiate me?” he asked without hesitation. Mr. Niktab smiled and said that he would be delighted to do so, and instructed one of the darvishes to help him obtain the items needed, and explain the details of initiation. And so it was that on the third day, the old man was initiated as a darvish of the Nimatullahi Sufi Order; he was given his zekr, and formally gave his heart to God and his head to the Master. And he was happily welcomed into the circle of Lovers. After the meeting was over and everyone had departed, Mr. Niktab spoke to the two dervishes who had traveled with him. Note: This is a true story, and it was also said that the old man completed the entire Sufi path in one year, which is truly unheard of, except as God wills. PS: Sunday, October 10th, is the second anniversary of the passing of Dr. Javad Nurbakhsh, (12/10/1926 – 10/10/2008) who was for fifty-five years the Master of the Nimatullahi Sufi Order. Deserts and Mountains, the debut novel by Yilmaz Alimoglu, is a lovingly told tale, and an adventure of self-discovery that is also a Sufi journey, all written with warmth and wisdom, tenderness and real affection for the characters. Ali Dogan is a expatriate Turk living in Canada who in the first chapter has separated from his wife and two children. He is also a new dervish on the Sufi path, and when he asks his Sheikh for advice, he is told (in a truly beautiful, descriptive way) to seek knowledge, so as to understand what his heart is telling him. This sage advice begins his journey, which takes him literally to deserts and mountains in both a physical and spiritual way. From Canada to Turkey (and his mother and father who still live in the same village), with side trips to the Acropolis in Greece and the Alhambra in Spain, he takes the reader on his journey of knowledge – from the new world to the old, from the freedom of Canada to the repressive state in Turkey, where primitive and cruel customs still prevail, to Greece and the beginnings of real civilization, the “birthplace” of Western knowledge, to the Alhambra, a symbol of the golden age of Islamic knowledge. Even in Istanbul, that ancient metropolis that is the bridge between East and West, there lingers what he calls the corrupt remains of the Ottoman Empire, and the old and ugly patriarchal ways women are treated like property. He encounter this first hand when he develops a crush on Nour, a brilliant Turkish co-worker who cannot escape the fate of being a divorced woman with a jealous ex-husband. Onward the journey continues, to Germany where the emotional stress of Nour takes its toll, then to Mali and the Sahara, and at last coming to terms with the vulnerable and confused man that Ali is, and of the soul seeking knowledge, balance, peace of heart and mind, which in the end he finds where he began. You are currently browsing the Darvish blog archives for October, 2010.